I have met some interesting divers, some entertaining divers, some reluctant divers, but mostly I can report to you after 32 years of diving that I seldom meet a diver that I do not like. Diving for me has always been a distraction from the ever-increasing fast pace of life. I find a nice long dive allows me at least 45 to 50 minutes of quiet bliss usually followed by the fellowship of divers that enjoy the telling of their tales until the next dive begins. That is pretty much what my weekends and holidays are like. Not all that exciting but it offers me a certain relaxation that a golf course does not. Divers, as a group, usually get interested in one aspect of diving and then find dive buddies who share a similar interest. For me it is photography, for others it may be spear fishing, shell collecting, fish identification, wreck diving, deep diving, or technical diving. Here on Okinawa we have been blessed with a diver that enjoys all of these areas but these individual interests really don't make his ice tea get colder. This diver, my buddy, finds challenge in trying to make diving safer for everyone. I have seen this diver spend hundreds of his own dollars on rope and chain that has been silently assisting divers up rocks and difficult inclines at dive sites throughout the island. I have seen this diver assemble weather forecasts and distribute them via email, again at his own expense and time. Since diving is accepted as a buddy sport and we all agree that diving is more fun when we gather in groups and explore the Underwater World together we are fortunate to have someone like this diver, and his enthusiasm for safety, looking after our best interests. The direction of the wind does matter and he has been dutifully reporting it on his website every week for about the past year. 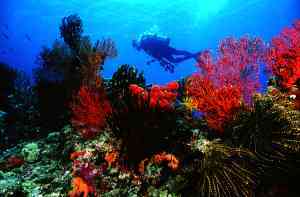 When diving is safer it is always more fun. We minimize the risk that diving presents us through preparation, training, and skill performance. But we also minimize our risk in diving when we have folks who care about safe diving and are willing to get off their backsides and do something about it. This diver has been that kind of dive buddy to all of us here on Okinawa. You may have a dive buddy like the one I have described. The guy who checks the tide tables and tells you when the best and worst time to dive will be that day. You may have a buddy that always gets the tanks for you when you are working late, or reminds you when Torii, Kadena, or Tsunami Gear is having a gear sale. You may have a buddy that checks your air to make sure it is on before every dive and does not chance it any other way. If you have a buddy like this maybe it is time to pause from our busy schedules, turn off our cell phones, click off the e-mail and take the time to say thanks to that buddy for looking out for you. Buddies like this make our diving safe and fun. It may be time to slow down just enough to realize just how good we have it here on Okinawa and tell a friend, your dive buddy, thanks for making it possible. DiveCast weekly on his website at www.h2okinawa.com and he has never asked us for a thing, no advertising, no editorials, no talk, just an emphasis on his love for safe diving. I need to thank my dive buddy for all that he has done for us. So this week while you are suiting up and your dive buddy is helping get that low pressure inflator/deflator out from underneath your armpit, or is there to hand you that second stage that wrapped itself around behind your head, or reminds you to change from snorkel to regulator just before you descend, please take a moment and just say thanks. As for me: Thanks R.C. you have made diving safer for me and for lots of folks who may have never known all that you have done for us. You are that true diver that has always surfaced to help us. Thanks.